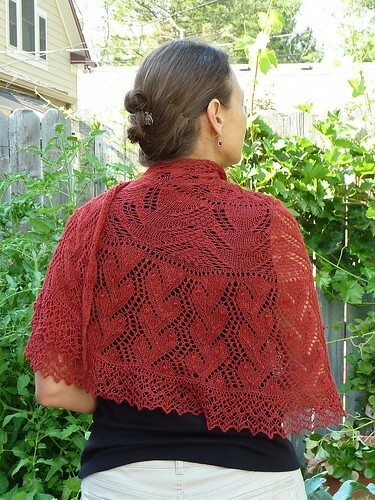 I wasn’t able to participate in Susan Lawrence‘s “Summer of Intrigue” mystery KAL last year, but I certainly bugged her to write up the pattern after it was over, and I saw how lovely it was. So as soon as she published the pattern (now called “Progression“, I was off to get the yarn to start it. It wasn’t a fast knit, since I only worked on it when I was at home watching movies on TV, but it still held my interest, with all of the different stitch patterns. The pattern is designed to start out simply, with written instructions, and then progressively get more complex, ending with a knitted-on border with patterning on both sides, which is worked exclusively from a chart. I didn’t care about any of that… just that it was lovely, and I wanted to do a semi-circular shawl. I also didn’t block it quite as aggressively as she did hers, so between the tighter tension and lighter blocking, mine turned out smaller than hers, but the size works well, so it’s not a problem. And bonus! Since I bought extra yarn in case I used more than she did, I now have enough of the yarn left over for another shawl. I really like the half-circle shape, and I especially love the border. I tried a new technique with the nupps, which worked out quite well. Instead of a single YO, I used double YOs, and then dropped the extra YO on the reverse side before purling all of the stitches together. It made the loops nice and loose. It’s wonderful! You and that Susan make a wonderful team! Super elegant and beautifully knit! 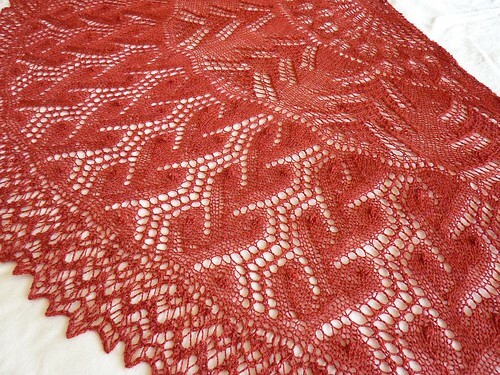 Progression is one of the best lace shawl patterns around and yours is especially lovely.